He was a founding member of Magnum Photos and a collection of his works can be seen here. And you can buy the book on Amazon here. It’s a great study and I love the notion offered by Cartier-Bresson with the idea of the “expression that life itself offers you,” and that you, the photographer must have the “intuition” to know when to create the photograph. It’s what we do all the time. But what happens when we want to extend that way beyond the moment? We call it long exposure photography, or long exposure photographs, but the main idea here is we’re capturing a moment that lasts not just an instant, but several instants compiled together. So, in a rather tongue-in-cheek fashion, I might suggest we call this type of photography as capturing “the decisive minute,” or something like that. Whatever fancy name we concoct, we’re talking about extending that shutter time, so we capture the movement of our subject and we are then creating an alternate reality or understanding of our chosen subject. There’re a few things we need to prepare to capture long exposure images. First off, you’ll need a filter of some sort. You can also photograph later in the day but even still, to get really long exposures a filter will help. If you want to keep the color in your images looking good, you’ll need high-quality filters. I use filters from Breakthrough Photography. But you can also use B&W, Singh-Ray, Lee and other high-quality brands of filters. I’m not paid by Breakthrough, I bought my filters like everyone else, it’s just what I use. Please stay away from cheap filters as the color cast they induce on your photographs is just terrible. 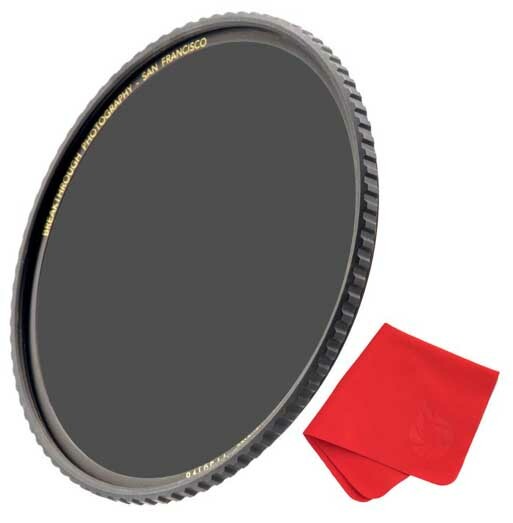 I have the 10-stop neutral density (ND), 6-stop circular polarizer (CPL) and the 3-stop circular polarizer. I like the polarizer options since they are color-neutral, but they can also have a polarizing effect if you want it, or just rotate it to remove the polarizing effect. The new tripod design by Colorado Tripod Co.
Next, you need a solid tripod. A small travel tripod may be able to do the trick, but the sturdier your ‘pod the better. I use a carbon fiber model by Induro. I’ll soon be able to test a tripod and ball head from Colorado Tripod Company, so I’m looking forward to that. With a good tripod, it also helps to be able to anchor it. Some spike feet can help, but a weight hanging from the center column, or if you don’t have a center column hang it under the central apex where the legs come together, will help a lot. And spread those legs out further than the first stop on the leg adjustments. I would also suggest keeping it as short a possible. Fully extending the legs just makes it more susceptible to vibrations from the wind and other items. I use the time delay on my camera which allows me to hit the shutter button and then two seconds passes before the exposure begins. You can also use a cable release if your camera supports that option. I don’t usually use the mirror lockup. Partly because when I’m shooting like this the mirror is already up because I’m using the live view mode. The other reason is that the vibrations from the mirror might last a fraction of a second. But when you have an exposure that is multiple minutes, that fraction of a second is nothing to your exposure. I will absolutely use a mirror lockup if my exposure is between 1/30 second and 4 seconds. Because it’s in that range that the mirror vibrations may affect the exposure and stillness of the camera. It’s also a good idea to stand between your camera and the wind if it’s a windy day. That wind can cause lots of vibration which will soften the subjects and not deliver a sharp image. And finally, be sure to block the viewfinder if you’re shooting a DSLR. If you’re shooting a mirrorless camera you have nothing to worry about. But for the DSLR, it’s possible to get some stray light leaking in to the camera and it will either affect the light meter only or it can possibly get some light down into the sensor area if it’s bright enough. Depending on how much light you have in your scene, you may have to compose without the filter in place. Ten stops of light is a LOT of light that is removed from the scene by this filter. And auto focus likely won’t work either. In really bright scenes I’ve had AF still work, but many times it hunts and just can’t get a lock on a subject. If your lens or camera body has an anti-shake or image stabilization technology, turn it off. Many of them are rather smart these days and they detect that it’s mounted on a tripod, but I like to turn it off to be safe. I like to find a subject that is rock solid amongst something that has movement. That way the solidity of that object can be enhanced during the long exposure since the movement of the other elements will blur out into streaks of motion. If you’re photographing water for example, the water will keep moving by and you’ll get the nice silky effect. 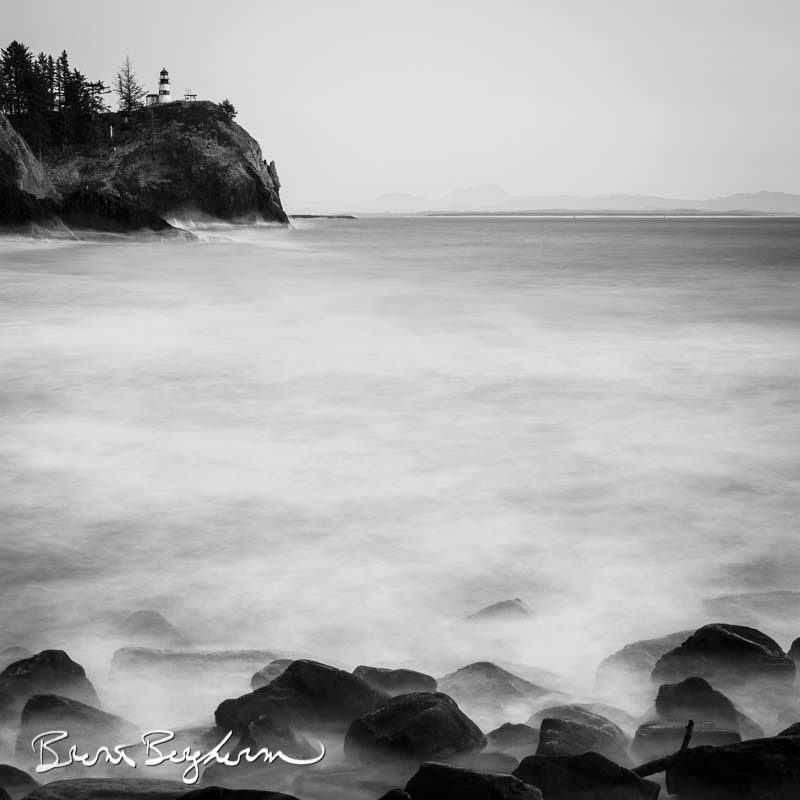 If you’re at the ocean or a lake, a long exposure can turn a somewhat choppy surface to one of glass. Photography is a challenge already. Then when we add this notion of multiple minutes of exposure we are adding even more challenges to the mix. We’ve got the technical challenges, and of course a different set of creative challenges. I recommend taking a few test shots. Get a feel for how your subject looks with long exposure. If you really can’t see the benefit of going with a long exposure, then you need to either get a different subject or modify the settings so you have an even longer exposure. Once you can get a sense for what’s happening, ask yourself a few questions. Is my subject enhanced positively by the motion that’s happening? What mood am I creating by including this motion? Do I need to alter my settings to achieve a different goal for this image? Is my main subject sharp enough? Go ahead and zoom in on your little LCD panel on your camera and inspect the details. If you have some softness occurring, it could be for any number of reasons. It’s usually missed focus or subtle shakes in the camera. 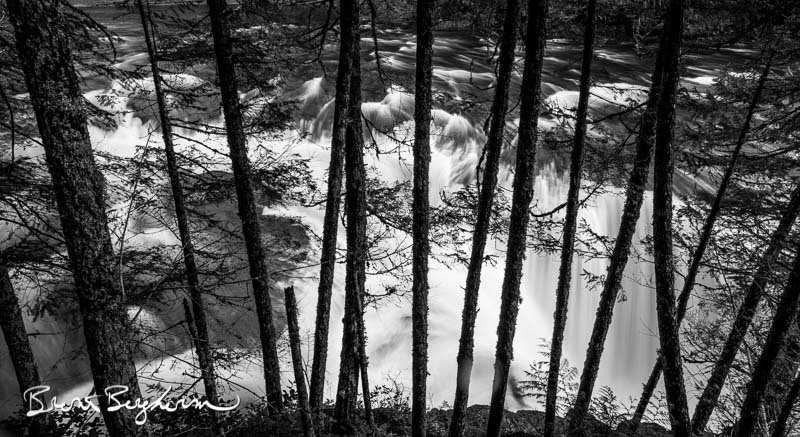 Long exposure photographs tend to work better when the scene is minimized to its utter simplicity. Try and remove any distractions that will compete for the viewer’s eye. Try and predict how the viewer will look at the scene and adjust as needed for the desired experience for your viewer. This could be pointing the camera up, down, or considering what you might do in post-production. In general, the overall approach I take has me focusing on the bare-bones of the image and my subject. The shapes, forms and textures will become more important in the scene as compared to specific subject matter, color and the like. Like this image here. The parts are important, but it’s the collection of the whole that really makes it sing for me. It’s about enhancing whatever your subject is by causing the detail of whatever is moving through it or around it to be blurred. While the motion will create its own interest for the viewer, it’s usually successful if it contrasts and supports the subject that is rendered sharply. 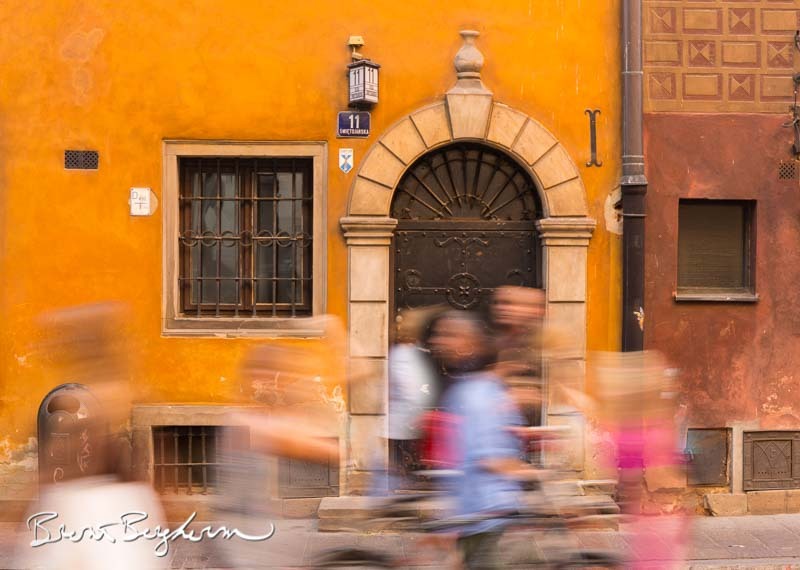 Multiple long exposures were used and combined in Photoshop to enhance the feeling of a busy street in Warsaw, Poland. And finally, maybe you can use a long exposure photograph to eliminate something from a scene, or enhance it like in the image above. If you’re in a somewhat crowded space, you could use a 10-stop filter to simply not record the people walking through the scene. Or, if they’re still recorded you can massively blur their movement with a longer exposure. The 10-stop isn’t necessarily needed all the time, so use the tools that best match your subject. If the people in the aforementioned situation aren’t walking, but milling about, you can get rather interesting results. The exposure can be the tricky part. How long do you need? First off, shoot in manual mode only. Automated modes will simply be a work in frustration since most cameras don’t go over 30 seconds. You’ll need to switch to the bulb mode. This is often designated with a “B” in your shutter speed settings. Rotate your shutter speed to 30 seconds, then go one more click and you will probably be in “B” or bulb mode. This means that the shutter will be open for as long as you hold the shutter button down. On my Canon, there’s an option to set the duration of the shutter when you activate the bulb mode. It’s really nice to be able to hit the button and not worry about ensuring I release it at the right time. However, this is where a cable release really comes in handy. Many cable releases are programmable which means you can set it to expose for the desired length of time and then the exposure ends. Or it will have a button that you can easily lock down and then manually release it when the exposure is done. With this method you’ll need to use a timer either on your phone or stopwatch or something like that. If using a 10-stop filter, start by taking an exposure reading without your filter. You’ll then double that amount 10 times to reach your desired exposure. If your non-filtered exposure was 1 second, your exposure with the filter would be 1024 seconds. That’s over 17 minutes. A situation that’s more reasonable is if your unfiltered exposure was 1/60 second, your filtered exposure would be 16 seconds. Now that’s not too bad. Once you have an idea on what you want to set your exposure to, test it out. But please know, if you’re using your live view mode it’s highly likely that you won’t be seeing an accurate representation of what the final image will look like. My Canon 5D mkiv is a great camera, but when the exposures get beyond 10 seconds the preview on screen is not very reliable. You have to play back the image and inspect it once it’s recorded to your card. Also look at the histogram and ensure it’s rendering the subjects where you want them on the luminance scale. Adjust your exposure as needed. But if you’re at a five-minute exposure, let’s say, and you want to increase your exposure by a stop, then you’re going to ten minutes. If the light is fading, that can be a bit much to gamble with. So, consider raising your ISO or opening up your aperture if you can. This way you won’t have so much time invested in one exposure and you can adjust more quickly. But if you NEED that extra time to achieve the effect you’re going for then, of course, do the shutter adjustment. Capturing successful long exposure photographs has its challenges that we need to be aware of. Some of these were already mentioned above, but I think it’s worth repeating some of them here and then we have some new ones too. Vibrations caused by wind is very likely. But also think about the surface you’re standing on and that your tripod is standing on. Will people walking by cause vibrations on the ground? I always stand very still when getting a long exposure because I don’t want my movements to cause problems. Digital noise is also a potential problem. Most modern cameras do really well at handling noise, but even the best cameras can exhibit problems from time to time. Since you really want a long exposure you’ll be gravitating towards an ISO of 100, which will help with keeping noise down. But when you get a really long exposure, your noise will build up no matter how good your camera is. This is mostly noticed in the shadow areas. I do like to try and expose to the right and by that I mean to make things slightly brighter than you might intend them to be. If you end up darkening them in post-production, you’ll minimize the noise and it won’t be bothersome. If you brighten an image in post, you run the risk of having noise popping out. Noise reduction tools in your processing software can help mitigate this issue but it’s just something to be aware of. A clean filter and lens is absolutely necessary. It’s so easy to get a speck of dust on the filter and try and not worry about it. I would argue against that since it can easily scatter the light and since we’re getting such long exposures it can cause a little extra havoc. If you don’t have a 10-stop or a 6-stop filter, you can do something else. That is to shoot multiple frames of the same subject and then combine them in photoshop. It’s called Exposure Averaging. When you do exposure averaging you’re simply taking multiple images of the same scene. Your camera should be on a tripod. Set your camera to motor drive and grab several frames. In my opinion you get better results if you stop down the lens and get a bit longer of an exposure for each capture. Say about 1/8 of a second or maybe slower if possible. Shoot multiple frames and then process them as you normally would in your raw processor. Take the images into Photoshop and open them all as a layer-stacked image. Then select all layers in the layer stack and convert them to a smart object. Then go to Layer>Smart Object>Stack Mode>Mean and the images will be averaged. Say you did the 1/8 of a second exposure mentioned above. If you shot 8 frames, you’d have the equivalent of a 1 second exposure. However, you do have the time between the frames that you’ve lost out on. So if you’re trying to get cloud movements or other items like that and absolute smoothness is required, this may not be the best solution for you. But if you were to get something like 40 frames you’d have about a 5 second exposure total. That would do well for averaging out things like the ocean, rivers and waterfalls. But there’s another benefit. The ISO equivalent drops dramatically. If your ISO was set to 400, and you shot 40 frames the math looks like this: 400/40=10. Your equivalent ISO would be 10!. That’s crazy good noise reduction right there. Of course, doing this technique doesn’t allow you to see your results in the field. And there’s the whole idea of who wants 40 frames of the same subject? I suppose you could delete those frames once you have the image built in Photoshop. No matter which way you do it, either waiting for low light so you can get long exposures naturally, using a filter or using the exposure averaging technique, experimenting with long exposures can be fun and quite rewarding. It just may open up a whole new world to explore in your photography.